How can farmers help with the clean air initiative? Livestock farmers are in the firing line in the Government’s new consultation on clean air. Chloe Palmer speaks to the experts to find out more. Livestock farmers are once again being targeted in relation to the potential environmental impact of their farming activities. Defra recently launched its ‘clean air strategy’ consultation and within this document, agriculture has been highlighted as accounting for 88 per cent of ammonia emissions. Cattle are the source of a substantial proportion of this total, specifically the contribution made by housed dairy cattle. The Government has indicated it will introduce ‘clear, proportionate regulations’ to tackle ammonia emissions so it can meet the targets it is committed to. Grace Righton, environment adviser for the NFU, says: “Ammonia is still a relatively new focus for the government so many farmers have not yet been made aware of why ammonia is an issue and how their farm practices will have an impact on emissions. Ms Righton suggests more needs to be done to improve and widen the scope of data used to estimate current ammonia emission levels to enable ammonia mitigation measures on the farm to be recognised. David Ball, senior technical manager with AHDB, says there are measures farmers can take to help to reduce ammonia emissions which could also benefit their business. He says: “Ammonia is formed when urease, an enzyme produced by microorganisms in faeces, reacts with urea in the urine. An obvious solution is separating the two products before they are able to react with each other but clearly this is not easy. Mr Ball recommends good drainage coupled with frequent scraping to minimise slurry contact with moving air to help cut emissions. Mr Ball highlights solutions developed in Holland, such as geotextile membranes on floors which the urine can drain through, but says this is still undergoing development trials. Straw housed systems generally create less ammonia as urine will drain through straw leaving dung on the surface; adding more straw regularly further reduces emissions. Mr Ball acknowledges converting from cubicles to open yards may not be practical and with the high price of straw, can be a costly response to the problem. The method of storing and spreading slurry is another important factor, according to Mr Ball. He says: “Covering slurry stores and even manure heaps may be a requirement of future legislation as this reduces ammonia emissions substantially. “Switching to shallow injection of slurry reduces the amount of contact between the slurry and air so dramatically reduces ammonia production. Although not as effective as shallow injection, the use of trailing shoe or dribble bar application methods are a substantial improvement on splash plates which may be outlawed in the future. “Grants for this type of low emission equipment are available within the farm productivity grant scheme and this is an indication the Government is looking seriously at ammonia as an issue. If these measures become mandatory, it is unlikely any grant aid will be available to support their purchase,” Mr Ball adds. Looking at measures which have a dual benefit of lowering emissions and saving on costs is where AHDB is focusing its attention, according to Mr Ball. “Alongside improving air quality and as a consequence the nation’s health, there will be a benefit to the farmer from reducing ammonia production from livestock. As ammonia contains nitrogen, if it is being lost to the environment, it is no longer available to the growing crop. “If farmers can take steps to retain the nitrogen in slurry and farmyard manure, it will be a more valuable product. For example, by adopting shallow injection slurry rather than using a splash plate, the farmer can reduce ammonia emissions by up to 70 per cent and avoid the loss of up to 80 per cent of the nitrogen content of the slurry to the atmosphere. In turn, he can save on bagged nitrogen. 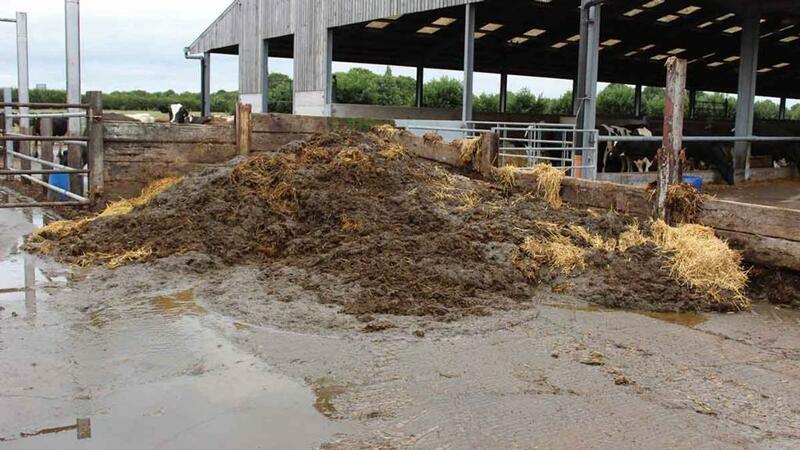 Cover slurry and manure heaps or use slurry bags. Use low emission techniques for spreading slurries on land, for example, shallow injection, trailing shoe or dribble bar. Wash down animal collection points soon after use. Switch from urea based fertilisers to ammonium nitrate or inject the urea into soil or apply it alongside a urease inhibitor.